PDC Spa and Pool World offers the finest Fiberglass Pergolas, Arbors, Privacy Screens Trellises and more! Fiberglass Pergola kits are easy to assemble, and can be used for many other purposes other than just for Hot Tub Enclosures. They are perfect for any beautiful backyard center! Built on the dedication to producing quality products and providing first rate customer service, PDC Spa and Pool World takes pride in the personal touch they bring to all of their customers. PDC Spa and Pool World stands behind the quality of every Pergola we offer. All DIY Fiberglass Pergola, Arbor, Privacy Screen And Trellis Kits Are Specially Crated To Protect Them In Shipping. PDC Spa and Pool World's convenient location expedites shipment, whether it be across town, across the country, or across the world. Fiberglass Pergolas DIY Kits - Our most popular pergolas are stock items that ship in a week. These beautiful and affordable pergolas are prefinished white with exclusive ChromaGuard® engineered coating and come with Arbor-Loc® Tie-Down System. Privacy Screens Free Standing - Turn any area into a private sanctuary with our Privacy Screens. Stock sizes, made with the same structural fiberglass materials used in our pergolas. Privacy Screens - Corner Privacy Screens, Free Standing - Turn any area into a private sanctuary with our Privacy Screens. Stock sizes, made with the same structural fiberglass materials used in our pergolas. Privacy Screen Attachments For Pergolas - Turn any area into a private sanctuary with our Privacy Screens. Stock sizes, made with the same structural fiberglass materials used in our pergolas. Entry Arbors - Entry Arbors are the perfect accent to any outdoor living space. These affordable arbors come as easy to install kits and offer a low maintenance enjoyment and beauty to your outdoor landscape. 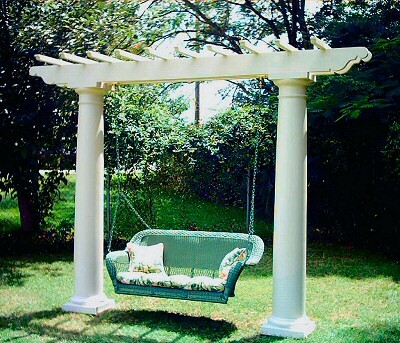 The swing arbor can also be integrated into a pergola. Swing Arbors - Swing Arbors are the perfect accent to any outdoor living space. These affordable arbors come as easy to install kits and offer a low maintenance enjoyment and beauty to your outdoor landscape. 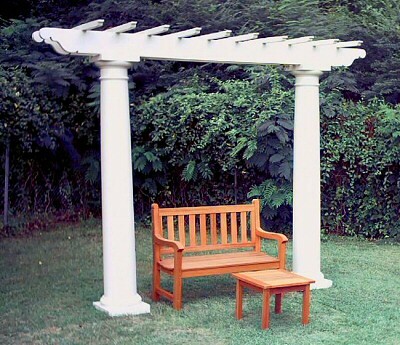 The swing arbor can also be integrated into a pergola. Trellises - (also known as an Eyebrow or Wall Trellis) are decorative accents that transform the plan area located above garage doors to one of style and beauty. 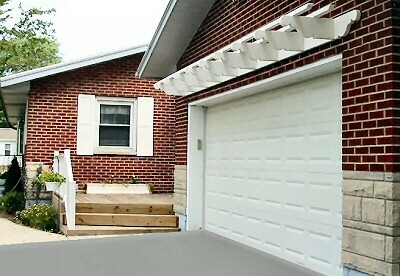 Give your home an extreme makeover! Why Fiberglass Pergolas, Arbors, Privacy Screens, Trellises? Our stock pergola kits are wind load rated. Fiberglass beams can span longer distances than wood or vinyl. Unlike wood, their high strength-to-weight ratio keeps them from sagging under their own weight. Unlike vinyl, they are unaffected by variations in temperature and will not sag in hot climates. Pound for pound, our light weight fiberglass-reinforced components are stronger than steel. This allows for quick and easy installation without the need for cranes or large crews. Fiberglass-reinforced composites are naturally corrosion resistant. They will not rust, corrode, or pit in external applications. Compared to traditional materials, fiberglass components offer a uniform appearance that lasts for years. They do not twist, warp, or bow after installation and they maintain their full strength over the life of the product. Our pergolas are fabricated to specific dimensions, making installation easy and fast. Parts are clearly marked and all hardware is included so that your pergola can be completed in hours. Optional wind load/deck plates do not include deck screws. PDC Spa and Pool World backs up their first-rate products with excellent customer service with a knowledgeable team of experts. You won't be on your own assembling any Pagola, Arbor, Privacy Screen or Trellis. PDC Spa and Pool World is only a phone call or e-mail away during regular business hours.